The majority of the books that I own come from charity shops because they make book buying affordable and accessible to me and there are around 10 shops to choose from in my hometown. I also really like that I can support local charities in a pressure-free environment, donating a few pounds as and when I can. CONSIDER your LOCATION I find that more affluent areas have poor selections. COMMUNICATE - get to know the staff as they may be able to keep a look out for certain titles do your research - know what titles you want and are looking out for and consider keeping a list read lots of reviews - know what titles are worth picking up before you go don't lose your head over the price - is it in good enough nick? Is it a decent edition? do you really want to read it? take advantage of post-holiday unwanted gifts - new year is a great time to buy new books in charity shops! donate books yourself - give a little bit back to the shops. re-donate the books you probably won't re-read. be patient - be prepared to sift and visit other places! 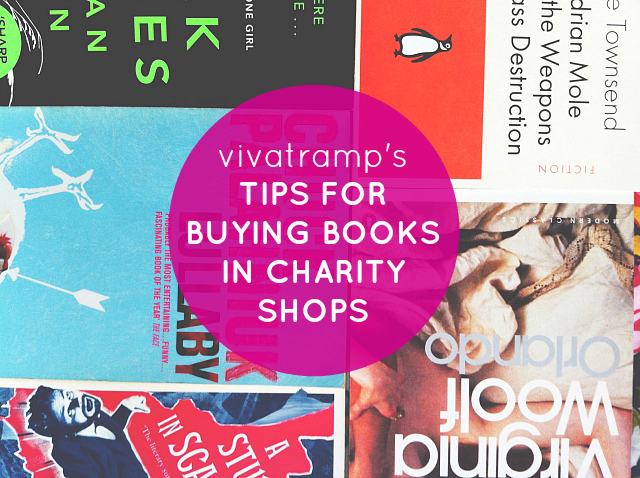 Do you buy books in charity shops? If so, what are your top tips? Also, what's your favourite charity shop book purchase? If you'd like to scroll through all of my advice posts then you can do so. I do try to take a regular bag of things to my charity shops and when I do I can never resist a little look at the books. I've always been so good with finding treasures in charity shops, some of my favourite books cost about 50p! There's one end of my town that absolutely saturated with charity shops and they're always full of decent things, plus it's for a good cause so how could you resist?